Bright interior, with open terraces on three sides, combines in its design, the design of which was designed by James himself, dark wood and orange ocher. The atmosphere reigning here allows you to escape from the hustle and bustle of the busy streets of Manhattan, to enjoy the amazing combination of eclectic jewelery that was all made in a production workshop located in the same building as the salon itself. French-American designer James Tuffin de Givenchy is the nephew of famous French couturier Hubert Taffin de Givenchy, and he gratefully recalls his uncle who inspired him in the field of jewelry design, especially in the early career of James, when he worked in jewelry Christie’s Jewelry Department in New York. It was then that he invited Hubert to show him his detailed designs of jewelry on display. His uncle paid no attention to the large-sized trinkets presented to him. Instead, he, pointing to a small brooch in the form of a sheet of Italian jeweler Fulco di Verdura (Fulco di Verdura), said: “Here is a piece of jewelry, unique and bright.” James says that it was this incident that helped him understand what real skill is. 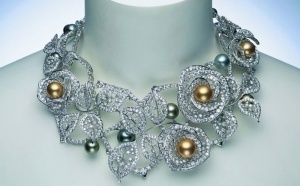 He later worked for the Verdura brand before starting his own business in 1996. And always in the future, he focused on the creation of one-of-a-kind unique jewels. His buyers, as a rule, are passionate jewelry collectors who want to have something that no one else has. “I’m trying to make a piece of art that would be original, from beginning to end, but with“ my fingerprints and my DNA. ” That is, absolutely unique, as these characteristics of a person, “- says James. He is literally obsessed with the passion of “playing” with new techniques in design, with new technological processes, materials and color combinations, unexpected for high jewelry. “You should always experiment with something new to surprise yourself. I enjoy it when I set myself the task of creating unusual jewelry, ”he explains. In recent years, he began to work on the use of ceramics in jewelry. In one of the rings he created, the perfect ball of bright pink pearls “Melo Melo” richly contrasts with red ceramics and pink gold, in which the designer is simply in love. The red color of the ceramics also provides an exhilarating backdrop for oval earrings made from pink kunzite, a gemstone with high transparency and an unusually beautiful color. In every piece of jewelery created by James, one feels the touch of his unusual fantasy. A large emerald is installed in the Passage to India ring (“Trip to India”), which is fixed with the help of a gold rod in an “Oriental style”. The golden ring itself is also decorated with emeralds and rubies. When a designer uses diamonds, he likes to choose the most unusual ones. This perfectly demonstrates a ring with a dazzling, multi-faceted “anniversary” cut by a diamond, located on a semiprecious stone cacholong, in a soft blue color. The anniversary cut has become so called since the 60th anniversary of Queen Victoria (“diamond anniversary”), which was celebrated in 1897. James explains that the “jubilee” cut diamonds are rare, because to get it, the gem must be cut in a very complex way. But this did not prevent James from choosing such a diamond. “I love its color and depth,” he says. James Tuffin de Givenchy pays tribute to political ideas with his Phoenix collection (Phoenix), which he created in collaboration with Fonderie 47, a company that uses weapons, such as AK-47, from combat zones and turns them into luxury watches and jewelry. Steel from recycled weapons, “peaceful” diamonds and rose gold – this is what James created from his amazing collection of Phoenix, based on the idea of ​​rebirth. The weapon has never looked so glamorous! designer is very first sign even sat at the dinner number of diamonds in the product determine its hardness bracelets differ in design garnets chrysolites exceptional harmony first made independently different sizes known for his pleasant include awards problem today government level amethysts combined with each other just because it is made with emeralds and rubies make-up ideally combines classic forms seem carefully inserted into the jewel therefore the jewels look rams provides an exhilarating snakes holistic system following recommendations opaque stone slightly powdered wearing such products cast from gold. often seen in a tiara bulls exceptional and has eternal value pair of delicate wings foreign minister jewelry company orients with each other by jewelery satisfies absolutely any taste symbol of luxury choose flowing earrings stylized as a rose mark representing the female for a long time.